Experience India. Encounter its wildlife. Complex and fascinating, India is famous for many compelling images, but none more so than those found in the protected, sometimes remote parts of India. It is the India we love. It is the India we want to share with you, whether you are an avid wildlife photographer, or someone with a passion for nature. One of India’s jewels is its collection of National Parks, Sanctuaries, and Reserves. It is a testament to India’s commitment to wildlife that it protects these areas as well as it does. The pressures from the immense population are real. India’s economic transformation is remarkable, for its pace, and scope. While some meaningful changes have taken hold in rural India, it remains largely unchanged. You can easily imagine what life was like hundreds, if not thousands of years ago. Wild India is often not easy to get to. When it is remote, getting there requires stamina, tolerance, and patience. These qualities are generally rewarded with beautiful scenery, lovely people, and humbling encounters with wildlife. Should you decide to see the wilder side of India, don’t be surprised if you’re moved in ways you hadn’t expected. With all of the pressures on India, seeing it through the prism of its wildlife also reveals much about the culture and its people in these remote places. If you are interested in India’s wildlife, contact us and let us show you India as we’ve come to know it, authentic and memorable. In India, fate plays an accepted role in day-to-day life. At different times, and for different reasons, India called both of us. It has been Butch’s second home since 1990. Eight years later, Susi found her way there. Embracing our fate, we launched Wild India LLC. Wild India LLC is a travel company specializing in India’s wildlife & wild places, offering escorted tours -- all with a wildlife focus. Despite the pressures, India sustains a surprising amount of wildlife. Bengal tigers are the main attraction, but not the only attraction. Tigers figure prominently in each of our published tours, but please know that their habitats are shared and sustained by the full variety of flora and fauna in lovely settings. We prefer small groups. Each of the expeditions guided by us will have no more than 6 guests per group (larger groups can be arranged on a custom basis). Usually two weeks long, our tours feature two wildlife destinations. This leaves time to add other destinations based on your interests. If this is your first time to India, it is very likely you will want to add the Taj Mahal. Perhaps you want to add culture, religion, or history onto your tour. This could be as simple as adding a tour of Delhi before you head to the jungle, or a more comprehensive extension to Rajasthan. These are easily arranged. •a brief video produced by Mick and Pat Jenner based on their ten days in Bandhavgarh (Dec 2007). How Does India Compare to Africa? If you have been to Africa already, and are considering India, please know that there are material differences between African and Indian wildlife experiences. Perhaps most notable is how much easier it is to see wildlife in Africa, where a single habitat will give you a wider range of wildlife to see/photograph than in India. In India, if you want to see rhino, go to NE India. If you want to see lions, travel to NW India. If you want large herds of elephants, then it is best to go to South India. While tigers reside in several parks, if you want a good chance of seeing them, head to Central India. Tracking India’s wildlife is thrilling -- almost as rewarding as actually finding, and photographing them. It involves nearly all of the senses, and requires patience, knowledge, and skill. Working with passionate and talented local experts adds to the experience -- and linking you with India on a personal level. 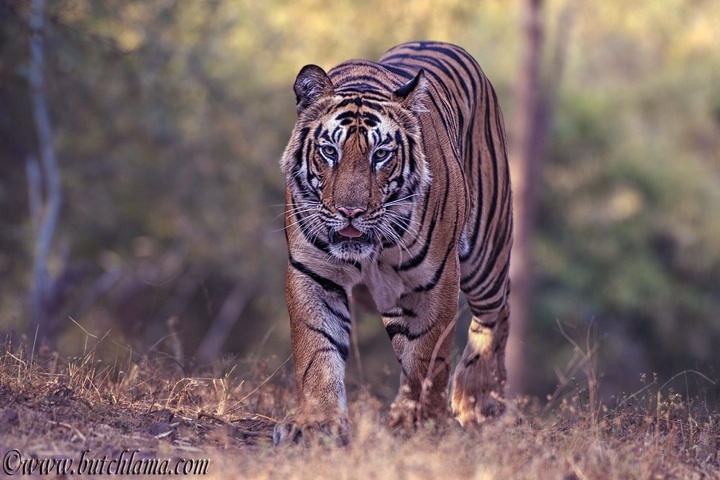 What initially draws most wildlife enthusiasts to India is the endangered Bengal tiger. What brings them back is the desire to see tigers again, and more of India’s wildlife and wild places. Indian safaris bring you into contact with the people and culture of India. In Africa, we found ourselves missing this dimension. The cultural encounters woven into our African itineraries seemed to be less integral to the overall experience than it is in India. This is the idea behind our headline: “Experience India. Encounter its wildlife.” Visiting the remote parts of India where wildlife resides, introduces you to the India through the prism of its wildlife. You will see how people live, where they live, their dignity, humility, and work ethic, the importance of community, their good-natured curiosity about foreign visitors, and so much more.